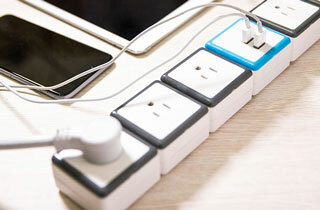 You can't have too many outlets with surge protectors for your devices. Get the STACK 6-Port Modular Surge Protector + USB Charging Module for $46.90 at Escapist Deals. This compact stack comes with six AC outlets and a dual USB charging block, all with built-in surge protection. And they're designed to be fully extensible, so you can keep adding more blocks whenever you need them. Add on different types of sockets for TV antennas, phones, LAN surge protectors, and more. Charge everything you need, and never run out of room - instead of going in search of a new outlet, you just need to add a new STACK block. Power up. Get the STACK 6-Port Modular Surge Protector + USB Charging Module for $46.90 at Escapist Deals.